My first "real" job (read: one where I had to fill out a W-2 form and all that jazz) was working retail. I worked at a boutique clothing store that sold pricey, trendy clothes. Which was a little bit odd, because I myself was not very trendy, and I would have said my preference was definitely more towards the frugal side of things. However, I soon realized I loved clothes and didn't mind paying a bit more for higher quality and really unique items. Thankfully, we had many customers who felt the same way. I say that because it was a commission position, so my paycheck depended on how much product I could move. It was much easier when people were on board with paying $100 for a pair of jeans, rather than $10. But anyway, it was while working retail that I fell in love with Black Friday. I know that sounds like an odd thing to say, but when you work commission there is no better day than when customers flock to you in droves, desperate to get the deals and steals they are convinced exist. There is so much energy, and excitement when you know all your hard work is going to result in a big fat paycheck. Plus, we generally had pretty decent customers. When the average total was usually in hundreds (or even, on very rare occasions, over a thousand) you are just dealing with a different type of person. They aren't your average "pick a fight over the bargain bin DVDs" sort of shopper. So, I learned quickly to enjoy Black Friday and the big fat commission checks it brought. I did wonder why it was called Black Friday, though. I asked around and heard from various sources that supposedly it gained that title after the Great Depression when the Friday after Thanksgiving was considered the opening to the Christmas shopping season, and due to the massive increase in sales thanks to holiday shoppers, retailers would go from being "in the red" to "in the black", accounting-wise. So I while I still thought that was a little odd, as usually "black" has a more negative connotation, I was satisfied. I have maintained my fondness for Black Friday since then, although the reason I like it now has more to do with spending time with my family (we all love to shop) and getting good deals. So that might be part of the reason that I slip up, and when referencing Good Friday (as in the day we commemorate Jesus' death on the cross) accidentally call it "Black Friday". (I know you thought I had lost my mind talking about Thanksgiving shopping at Easter! Don't worry, I do have a point.) I wondered if maybe there was anything in common between the two days so I decided to look up the history of Black Friday, as I am already fairly familiar with the history of Good Friday (Thank you, Jesus!). I was interested to find that I had been given bad information. The term "Black Friday" was first used in the sixties, and *not* for positive reasons. It was used by the Philadelphia Police Department to describe the chaos and confusion caused by the masses of shoppers, and was perceived by the PD to be a rather dismal day indeed. As the term continued to gain popularity, it was not highly favored by retailers, and for good reason. When you think of "black" it doesn't really incite positive vibes. Also, it is hard to not to think of things like "Black Thursday"-the name for the day when the bottom fell out of the economy in the U.S. and the Great Depression started. Or, that when we are mourning someone's passing we wear black. It is a color devoid of hope. However, with the upbeat-ness that usually accompanies the ability to run a successful retail operation, stores decided to turn things around, and that is where the explanation of the phrase "Black Friday" in terms of financial gains came from. Why not use whatever you can to your advantage? So, they perpetuated the rumor that the moniker came from the profitability of the day, going from being "in the red" to being "in the black". And I don't think it is too far of a stretch to say that there are definite similarities between those Fridays-Good and Black. Good Friday-taken alone, without the joy of Sunday, had to feel black. The blackest of any Friday, ever, actually. I cannot begin to fathom the despair that those who had followed Jesus felt. However, before any religious group applied the term, to the enemies of Christ it had to seem like the most good of any Friday. They had won! Or so they thought. But just like Black Friday, it seems Good Friday experienced a little bit of an image overhaul. And the turn-around was pretty darn quick. To those who had sought Jesus death, dreaming of the day the would be rid of that trouble-maker, rabble-rouser who turned so many of their carefully protected religious rules on their heads, their victory was short-lived. Good Friday had a black eye by Sunday in their minds. But for those who loved Jesus, Sunday was the day that turned that black day into something Good. And now, to me, this day is a day that can be fairly represented by both adjectives. Black, because we should recognize the severity of the price our sin-my sin-exacted on our precious, perfect Savior. A day to remember and mourn the cost of my unworthiness, my unrighteousness.
" ...He poured out His life unto death, and was numbered with the transgressors. His pure, holy, blemish-free life. For my worthless, ragged, wretched one. It was the most unfair of trades. But, like Black Friday, it took my account from debt to riches. From reddest red of His righteous blood, my glaring hell-red debt was paid, and name added to the "paid" column, from the "owed" line to the "saved" one. Good Friday is good because it was a black Friday, too. Black from the sin, the doubt, the heaviness that cost Christ His life. So, so, good because I was reprieved from the death I was owed as the wages of my sin, what I had worked for and earned was eternal separation. But my debt was paid in full. From red to black. I don't need to shop around, the deal of any lifetime was given on Good Friday. His sacrifice is all I need, no cost-comparisons are necessary, I will never find a better offer. Nothing for everything. Death for life. Friday's blackness for Sunday's light. Filthy as night rags for the whiteness of robes of purity. I love this Good Black Friday. It is my favorite Friday to celebrate for certain. So, even when I slip up and call it Black Friday, it doesn't really matter because the significance is the same. 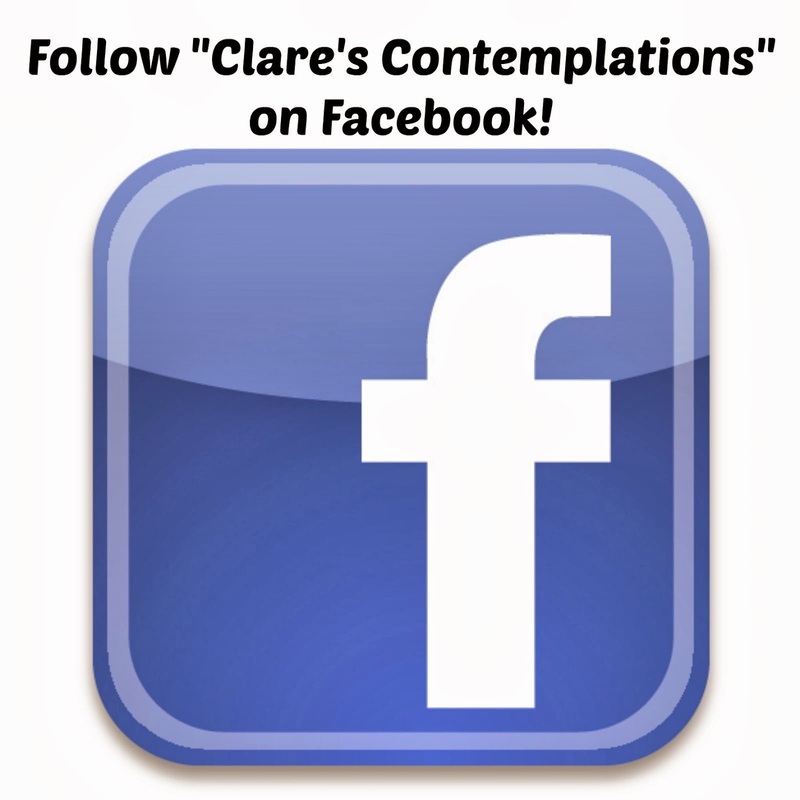 Today, I stop, I sit, I ponder the wonder of the day that Jesus *willingly* suffered death for me! Those who plotted and planned Christ's death thought they had a good Friday and got a black Friday. But I got all the best parts of both when I asked Christ to be my Savior. Accepting His gift of salvation erased my debts and made every day good-worth living to His glory. I am thankful for all of that day, the black and the good. So this year you got an early gift: your little cousin arrived a few days before your birthday! You were so excited that "Hedgie" was here and you couldn't wait to "squish" him. You have always loved a baby ever since you pushed your doll around in your little stroller. You especially love one that is related to you. "Hedgie" will have such an excellent example in you of what a godly man looks like. You are still so young, but you already show great maturity in so many areas. You are a fierce and loyal protector of those you love and you have continued to grow in your generous and thoughtful ways. You love to play the host and invite friends and family to our home. You want to take care of those around you. Even today at lunch, you wanted to make sure that you could share your special birthday dessert with everyone. I don't know how many things I would forget without you! You are willing to help me, offering frequently to vacuum for me and take care of other chores. You are really interested in learning to cook-I think you are going to be a real "catch" when you are older! Ha! You aren't just growing physically strong, though. You are working hard to grow in the Lord, too. You have been my biggest cheerleader as we have worked through the Awana book together this year. I have struggled, but you haven't let me quit. You put a considerable amount of time and effort into learning your sections, and you recite them flawlessly, which makes my heart so happy. You pitch in at church to help without complaining, which considering the amount of time our family spends there is really saying something. Moms often say that they wish their kids would stop growing, or at least slow down, but I don't usually think that. I sometimes get sad when I remember what a cute baby or adorable toddler you were, but I am so thankful for who you are now. You are still the same Carson in so many ways, just taller and smarter! I don't just love you, I like you. I don't want to rush your growing up, but I am so glad that you are doing just that. I know the Lord doesn't just have amazing plans for your future-that you are living those plans right now. I am constantly in awe that I get to be a part of that. And so, so thankful. I love you more than I can say. All caught up? Now I will show you a sample setting that I created. The idea here is to show you how to truly implement these ideas in your own home-no matter your style or color scheme. For this mock setting, I went with simple colors that will work in almost any home. As a matter of fact, you probably have similar items already! I chose to act as though this person has black and white as part of their color scheme. So I started with those two colors and to make it "Easter" appropriate, I added the third seasonal color: yellow. Total cost for "base" items- approximately $10. And don't forget, all these things can find uses elsewhere in your home. My tray lives on my bedside table, I can use both the pitcher and bowl as actual dishes, and the chalkboard could have schedules or menu plans on it if it isn't serving as seasonal decor. Then I add my "seasonal" touches. I would not purchase a candle and consider it seasonal decor. I would use a candle that fit into my decor elsewhere. I would not consider that to be something you would want to purchase as a "base" item, though, because color will limit its use. So, consider what accents you have around your home that are colorful, but not single-use. I "nested" the eggs in a piece of yellow tissue paper. We are just going to consider that "free", as well as the yellow chalk I used to write on the chalkboard. But, you might say, that's easy! Spring is simple, because of flowers, and Easter candy, and eggs! How do I transition this stuff to some other seasons? Well, I have some examples! Remember-it's April, so I am working with spring colors all around. But I have taken these same pieces and transitioned them to a set-up for Valentine's Day! I keep all my decorations for Easter, Valentine's and St.Patrick's together, so I happened to have a few things I could pull out. However, I really limited myself, so you could see you don't have to buy a bunch of stuff to make it work! Same pitcher, same chalkboard, same bowl, same black tray. But I added some tea lights and a small jar candle. I put some washi on the jar candle, I probably should have put some on the tea lights, too. I put a few felt hearts in the bowl, with a little clothespin I bought. I filled the pitcher with straws from the Dollar Spot and changed the art on the chalkboard. I attached the paper hearts (I used a punch, but you could easily just cut some out) with glue dots-but I don't recommend that! It was too sticky and pulled some of the paint off. I would probably just use scotch tape the next time. Or make a tiny garland. So, let's break down cost for this grouping. So, we've covered Valentine's Day and Easter. I wanted to show you one more switch. If you don't "do" Halloween, it would only take one or two little changes to make this feel perfectly "fall". So, still the same things: pitcher, tray, bowl, chalkboard. But now I've changed the red for orange. I pulled in my framed skull-it would be easy to find a similar printable online. Since it isn't exactly Halloween time, I "borrowed" my carrot cake Kisses-can you tell they aren't seasonally appropriate? Nope! I filled a small jar with goldfish, added a little jar with paper flags (actually from New Year's) and turned my Valentine's straws upside down and added some orange ones. I placed some little glassine sacks on the tray-to kind of imply that you should fill them with treats! 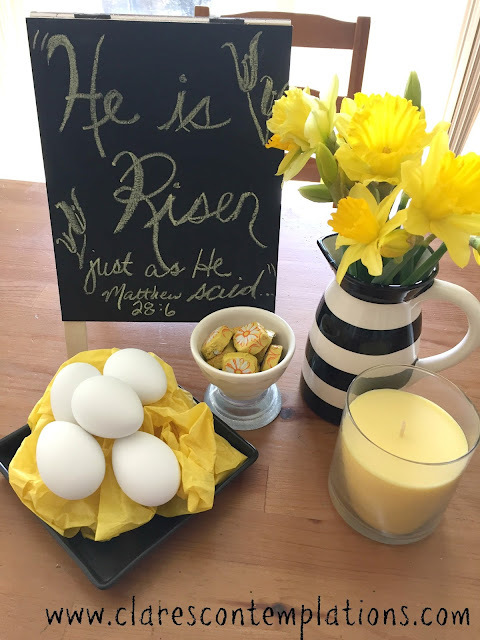 I used glue dots to hold the ribbon on the underside of the chalkboard-no peeling paint this time, and of course, changed the Scripture. (Sorry-definitely not my best work!) So, if I can decorate for Halloween in April and make it passable, it should be easy to come up with a cute set-up when it is actually the appropriate time of year! I am not going to price the goldfish, flags or straws, as those were purchased for other reasons. This is what I am getting at-when you start by using what you have you drastically cut costs! Look around for things that are the right colors and figure out how to make them work for you. As you begin to develop colors that you prefer for certain holidays, you will know what colors of paper,washi tape and ribbon to keep on hand. So there you have it: easy seasonal decorations three ways. I didn't do Christmas because people don't usually struggle with that. Summer decorations are really open-ended, other than 4th of July you could do just about anything! I often take summer "off" other than 4th of July, because between decorating for graduations and birthdays there isn't much time. But you could add a hot pink or a neon green to these items and have a really fun display. I've realized that creativity for many does not come naturally-myself included! It is a muscle I have to exercise-the more I use it, the stronger it gets. 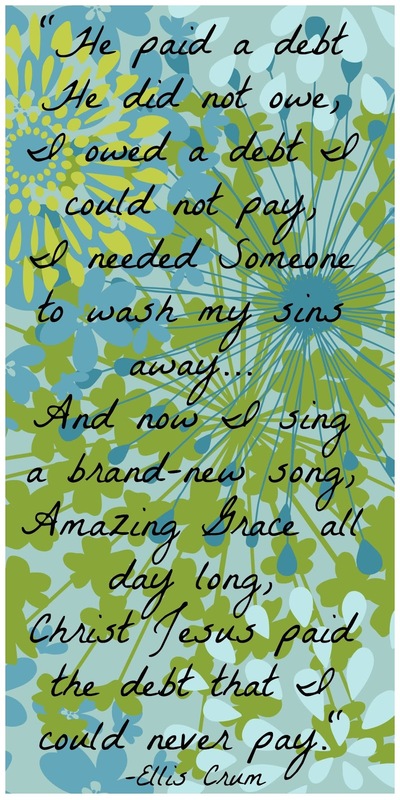 I recognized after getting frustrated early on when things weren't perfect it requires a lot of grace, too. My efforts aren't being judged for a prize ribbon. In my home it is about bringing a smile to my family and guests, about finding the beauty in each season, and about celebrating even the small things. By surrounding myself with things I enjoy, it encourages contentment and gratitude. I don't have to spend a fortune to do that! So here's my challenge to you: see if you can set up a small display in your own home with *only* things you have around your house. What can you make or re-purpose? What can you mix up to add a festive touch? Then, go to my Facebook page and share a photo with me! I love inspiration. Already do something similar with your holiday decorations? Share that, too! Let me know what your best tips are! There's always something new to learn-I definitely don't have it all figure out. Find Part 1 to this series here! 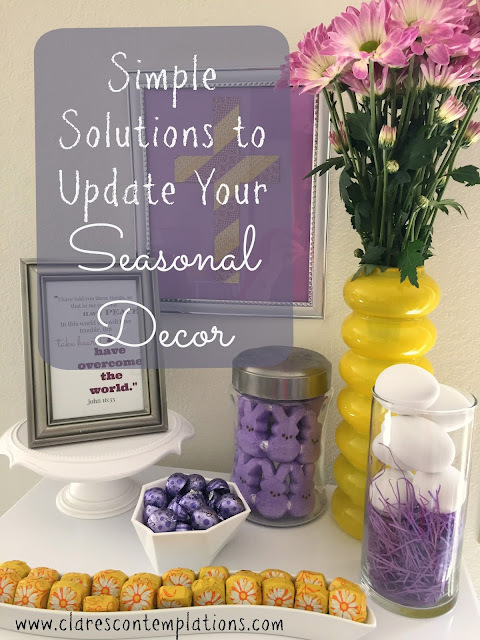 I'm excited to share some more ideas on updating your seasonal decorations! These are pretty photo-heavy posts, but I think the concepts are easier to understand when you can see what I'm saying. Seasonal decorating doesn't have to be expensive, time-consuming or clutter-y. I'm eager to show you how adding one or two things to what you already have in your home will help to create a festive atmosphere without making you crazy! 4. Add one or two things that are distinctively seasonal. My kitchen colors are red, and I keep a red felt wreath in there and when it matches my holiday colors I just find something to stick on it that pulls it all together. For Christmas, I add an ornament or two in turquoise, usually a snowflake or Christmas tree. For 4th of July, I added this little bunting and anchor (Dollar Spot at Target) to make it go with my theme. Look again at the photo from my Easter decorations this year. The only item in this picture that I have to store is the eggs. (I'll tell you more about my system for printables in a minute.) I often use candy as one of my elements because it is consumable, so I don't have to store it! The Peeps never get eaten, but at around $1 (I get them on sale at Target) I don't feel guilty about tossing them at the end of the month. They shouldn't be eaten anyway, in my mind! I chose plain white eggs. The eggs are meant to be dye-able, but I leave them plain white because then they go with any color scheme! If you have every paid any attention to my posts about decorating I use two things fairly frequently: candy and fresh flowers. In the Easter photo above, those are a $4 bouquet from Trader Joe's. They will most likely last the week and a half until Easter, so definitely worth the money, in my opinion. And I don't have to store them! This is a great example of using candy. I bought a dollar's worth of red and white gummy bears from Winco, picked all the red Sour Patch kids out of a clearance bag of Christmas ones, and bought Sixlets at the Dollar Tree. I shamelessly pulled the skull sketch my cousin did for me because I loved the funky vibe it gave this vignette. Candy is also "disposable"-as in, if my family doesn't eat it (Over the span of time that I usually have decor up they will munch on it, and then once I pull everything down I put it in a designated spot where they know they can go whole-hog!) I have no problem tossing it-although I can often find friends who are willing to take it off my hands. People will ask about the temptation of having all that candy around, and I have a few things that help in that department: I will often buy candy I personally won't eat (Sixlets? Peeps? GROSS!). I also use really small quantities (the Sour Patch kids, for example) so I'm not tempted because I don't want to ruin my display. Also, constantly having candy available actually encourages me personally *not* to eat it, as I know I can always have some later. I can usually keep putting it off so "later" never comes! Ha! 6. Change up your chalkboards and frames! If you haven't noticed yet, I get my money's worth from this little chalkboard. It gets a makeover for every season. I paid $3 for it from Target's Dollar Spot. Best decorating purchase-EVER! I look up ideas on Pinterest and do my best "third grader imitating professional" art on them. The handmade look is in, right? Scripture is always my go-to choice for what to write on them. I spent a little bit of time (a couple of hours on Pinterest looking at tutorials) and realized the easiest thing to making your chalk art look better is to emphasize the "down" strokes of your letter. Just that simple thing makes all your work look more artistic! Two tips: first ALWAYS season your new chalkboards by completely covering them with plain white chalk-actual chalk, not chalk markers or pencils! This will keep them from being ruined by having whatever you first write on them permanently stuck on them. I made that mistake with this one and I had to buy chalk paint to cover it and fix that. Now that I have seasoned it, I don't have that problem. Second recommendation: use real chalk on actual chalkboards. It gives it the most authentic look and erases better. I have a multi-colored pack of chalk from Target that was less than $2 and I use that all the time. If you have a metal chalkboard like the tiny one in the photo with the green books chalk markers are a better pick for that type. Also, if you don't plan on erasing it, chalk markers are more precise and long-lasting. I used those on the hanging chalkboard in the Valentine set-up. The frame above is the equivalent of the chalkboard. It gets a new printable or something each season. That costs almost nothing-just the cost of ink. 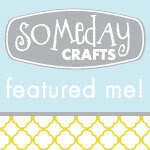 If you aren't into creating your own, I have lots available here on the blog (search "printable") or Pinterest has tons! The two sizes I use most frequently are 8x10 and 5x7. Here is my best tip for frames: keep your prints stored in them! I keep the cardboard insert that comes with most frames, or even just the stock photo that comes in them, and I file whatever isn't being "presented" behind that. In some frames I have as many as 4 or 5 different photos or printables in there at any given time. Side note: The set-up above was a great example of using what I had on hand. 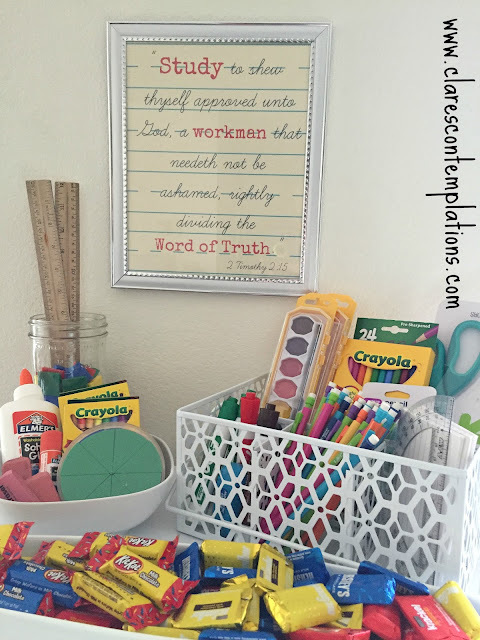 I wanted a "back-to-school" theme so I just arranged my kids' school supplies in a cute way! If you are looking for that printable, find it here. 7. Use paper or washi tape to get your desired effect. The garland above (from "The Grinch Christmas Party") is one of my favorites, but it was also one of the easiest. I simply used strips of paper, cut in a matter of minutes with my tiny little paper cutter, and chopped them to different lengths and then I hot glued them to the back of a ribbon. The whole thing took maybe 15 minutes but was so gratifying! No talent necessary. I have a whole post on how to whip up easy paper garlands you should check out if you need more ideas. I limit myself to the amount of paper that will fit in a 12x12 storage container from Michael's that is about 4 inches deep. It holds all my paper and felt, and I usually can dig through to find what I want. Otherwise, it is a good excuse to run to Hobby Lobby and buy a dollar's worth of paper to match! I try to stick with paper that is one or two colors and patterned, but not specifically holiday. The ones above were from a pack and I had them leftover from a wreath I made, so they are kind of an exception. Washi tape is another easy way to make seasonal decorations. The piece above was all washi. (Find the tutorial here. )I don't keep 500 rolls, but I do keep a small shoebox full and trust me, it's totally worth it. I made the shamrock in the photo with the succulent out of washi, too. I did that one a little differently, I laid strips on cardstock and then cut them out with a paper punch. And see, the washi helped me out here, too. This "tree" is a great example of how handy washi can be! This is actually decorator masking tape, but same idea. This was so cheap, but made such great impact! 8. When in doubt go with white (or glass). I've shared this tip in regards to party-planning, but it bears repeating here, too. When you are purchasing decorative elements or dishware, you can't really go wrong with buying classic white or glass. I don't have a huge amount of space to store things, but I get my money's worth out of a small collection of items. This isn't an exhaustive list, but it gives you an idea of my most used pieces. Amusingly, many of them are in the photo above! -several assorted (one cup volume or less) plastic and ceramic white dishes. I have a square one I am particularly fond of. -cylindrical glass vases. Two sizes. I bought the 7 inch one at the dollar store. That's the one in the photo above filled with the eggs. I also have a larger one for bigger arrangements. -small white cake plate. Mine is actually plastic and it is hilariously from the Halloween decor at Target. It was on mega clearance and I only paid like $0.50 for it. Pick one up at a yard sale or in the Dollar Spot for $3-$5. -larger white cake plate. Having two coordinating cake plates allows me to stack them onto each other for a tiered effect. They don't have to match perfectly! My big one is square and ceramic, the smaller one round and plastic. -various jars. I keep mason jars in both pint and quart sizes. I use these for food storage when they aren't serving decorative purposes. The container in the photo above with the silver lid is a favorite. You can get that style at Hobby Lobby for around $3. Choose things you can use for storage year-round so you aren't making space for empty containers for months! That defeats the purpose. Most of mine live in my pantry filled with boring things like fruit snacks and granola bars. When I want them for decorating, I unceremoniously dump them in a bowl or basket, wash them out and they are ready to go! Obviously, you can adjust these to suit your own decor style and colors. You could easily substitute metals (silver, gold, etc.) as those will go with most any color scheme. You can be a little more flexible with frames-I have a variety in both metal and black. I also have a couple of colored ones. This is such a tiny amount of stuff that if you *had* to store it it would all fit in a small storage container. However, find a place for it in your everyday decorating and you've made it work double duty! So that pretty much finishes up my broad-stroke tips for the best ways to decorate seasonally without spending a ton of time or money, or having a garage full of decorations. However, sometimes it is still hard to figure out to put those things into practice, so I have one final post in this series where I will break down the steps and show you a mock set-up. It may seem like I have the "right" colors or items to make these tips work, and you have different colors and you don't collect weird things like glass skulls, hand-held school bells and garden gnomes. But my tips will still work! I promise-you can do it. I love to change up my decorations around the house. If you know me, or have followed my blog for any length of time, you have seen some of the parties I have planned. To me, decorating for the changing seasons is a smaller scale version, but one I get to enjoy for longer than the few hours a party lasts. However, if I fell into the trap that I needed to buy new things for every holiday and season, that can get expensive. Even just storing stuff for the six or so times a year that I change things can be overwhelming. Can you imagine if I had a separate storage tote for all that stuff in addition to the several I have just for Christmas? I wouldn't have room for anything else! So, I had to come up with a better way. The system I have now works so well, I thought I would share it with you, in case you are looking for ideas for your own home! First, I thought I would show you this year's Easter decorations. I went with a yellow and purple theme (I'll tell you why in just a few minutes). I always decorate the top of my microwave (weird, I know, but that's just how it works out) so that space doesn't have any "permanent" decorations. That makes it easy to switch things around without having to store anything. So, I guess that is really my first tip! 1. Keep a (or several) small area(s) clutter-free so you have an easy space to decorate for any holiday. The other area that I always keep pretty clear for seasonal decorations is a small bookcase in my living room. Same concept-it has nothing that lives there so it is easy to move things around. When I know which spaces I routinely decorate it makes it easy to form my plan based on my needs. I never need anything too large, I have a nail above each space for hanging items, since I have kids I never choose anything too precious! These are the decorations from last year. Do you spy any of the same things? Yet, it is still different because I used some different pieces and this color scheme also had turquoise in it. Sometimes I decide to go a step further and I decorate my Expedit bookshelf. With the exception of Christmas, I almost always limit my seasonal decorating areas to the living room. They get the greatest amount of exposure there, but yet it helps me have some boundaries so I don't go overboard. And finally, these are decorations for the same season from 2015. Obviously, this color scheme was purple and turquoise. Now that you have viewed three years' worth of my Easter decorations, are you starting to see some patterns? Yet, every year there are some things that are different, too. 2.Use colors that are already present in your year-round decor. Let me share with you what I have figured out. One of the biggest keys to making my seasonal decorations more frugal, and less craziness inducing, is to choose a color that is already part of my permanent decor scheme! My primary living room colors are turquoise, yellow and lime green. So in 2015, I chose turquoise. In 2016, I went with two of the three, yellow and turquoise again. In 2017, I went with yellow. This is my Christmas decor from 2016, I think. (I can't exactly remember, those colors stay the same each year). Even for Christmas I made my colors work for me, choosing red to go with the turquoise blue that was already there. For St. Patrick's Day I pull out the lime green things I own. For Valentine's Day, it is the red I have in my kitchen. For 4th of July, I can do turquoise or again, red. But by making sure I use at least one color I already have in my home, I can re-purpose, instead of purchasing things to store 10 months out of 12. 3. Pick items from your year-round decor and use them in your seasonal groupings. See on the shelf in the Christmas photo above, on the right hand, the blue gnome? Not surprisingly, he also makes an appearance in 2015's Easter vignette. Except now, instead of appearing "elf"-like, as in the Christmas picture, he looks more garden gnome, right? Same object, but different placement. For St. Patrick's Day I decided to host a last-minute gathering and I only had about an hour to put together something cute. I gathered all my books that had green bindings and stacked them together with a green frame on top in one spot in the house. I didn't use a single store-bought "holiday" item, but having like items grouped together in a festive color conveyed the same idea. I also grabbed that "Trust in the Lord" sign to add to the grouping. I am not an artist, so please excuse my pitiful humble artwork. This little succulent got dressed up with a little washi tape. I keep the plant year-round, but for St. Patrick's Day it got a place of honor as the "centerpiece" for the table. Nobody would say a succulent is specific to that holiday, but with a little seasonally-coordinated tape it definitely adds to the vibe, right? This Valentine set-up is a favorite example of pulling from your own decor. The Fu Dog is a piece I keep out year-round, as is the silver school bell. A few "gold" (brown) books prop up a kissing photo-so "Valentine" but another thing I keep out all year! And see the "Trust in the Lord" sign? All these things look fresh and festive when I put them with a heart-shaped banner that declares, "Look at me! I've decorated for Valentine's Day!". I didn't use any "traditional" Valentine colors, but I still think it looks appropriate. Wow! This post kind of took on a life of its own! I wasn't planning on turning this into a series, but it seems to be appropriate. I'm so excited to share more of my thoughts and ideas. So, has anything made you consider how you can use what you already have to make your house dressed up for the season?